Nicole's Needlework: Now For the Stitching! 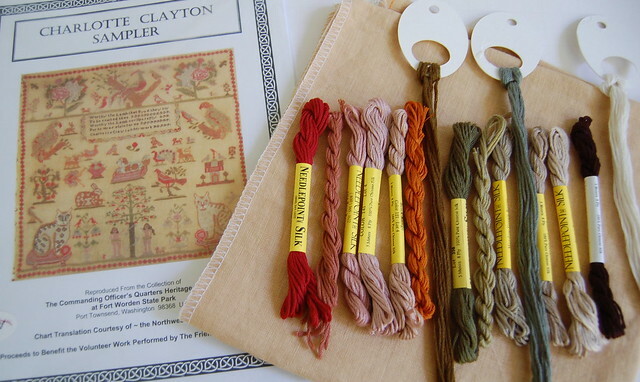 I've been playing with some threads and linen for a few samplers I would like to stitch in the future. The first is "Lucy Redd" by Homespun Elegance. I love Elizabeth's version and she kindly shared her conversion to NPI silks. The linen I'm thinking of using is 40 ct. Vintage Meadow Rue. Next is "Hannah Pepper." I started Hannah last year using NPI and then I realized there was an error in one of the magazines, which said the stitch count on one side was 265. It was actually 365. Ooops! I'm glad I only stitched a little bit. Since then, I have decided I would actually like to use the called for Soie d'Alger silks. And I had a cut of 40 ct. Lt. Examplar in my stash that was right size for the correct stitch count. 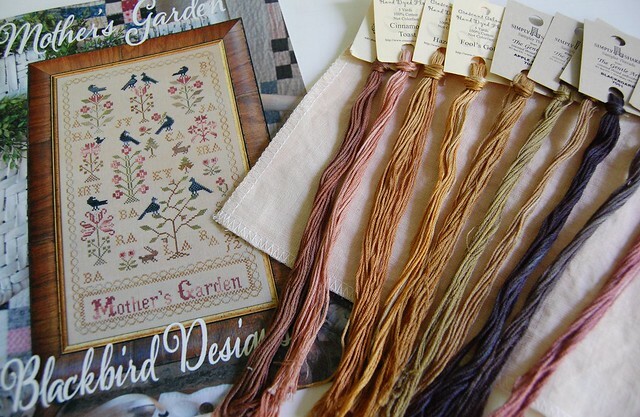 I got Blackbird Designs "Mother's Garden" from Down Sunshine Lane shortly after it was released. It's such a pretty design. I plan to use the same 40 ct. Vintage Lt. Examplar that I'm using for Christmas Garden. Last, I got "Charlotte Clayton Sampler" in a trade from Andrea. 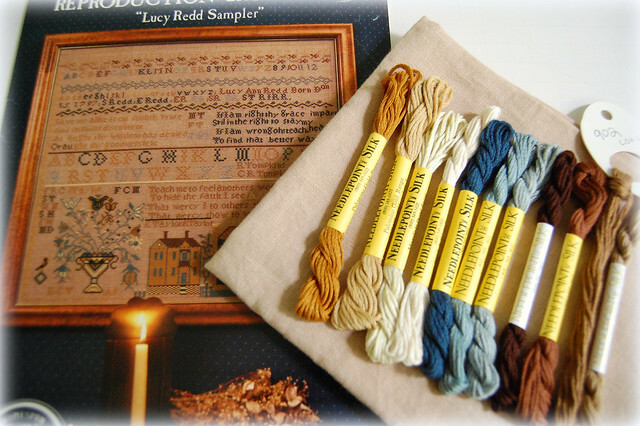 I have loved this sampler for so long and was so happy when Andrea offered it to me. 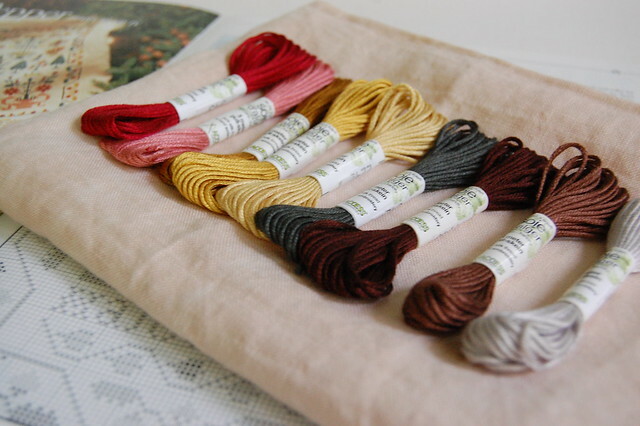 I'm going to use the recommend NPI silks on 40 ct. Vintage Sand Dune. I decided to start it last night in honor of my new kitty, Oreo. I just love those big cats on the bottom. I also have a little bit of progress on "Elizabeth Sheffield." 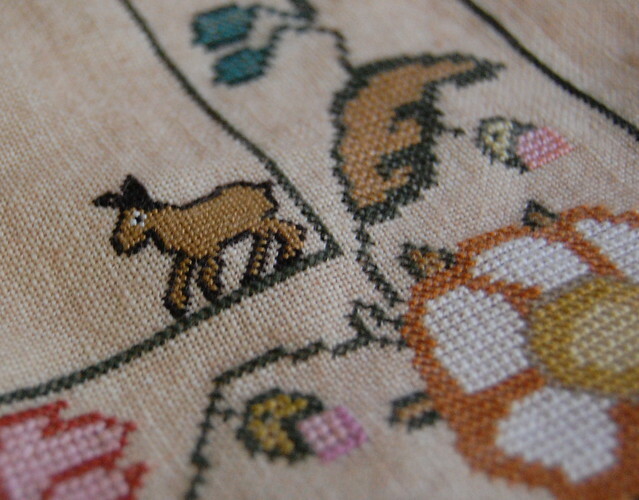 This little over one guy took me several hours to stitch! Oh yum yum yum!!! Everything looks so scrumptious! And your Elizabeth Sheffield is wonderful! Isn't it amazing how much longer an over one motif can take? Bleagh. But well worth the effort! You hav some big, beautiful projects planned. Awesome projects lined up, Nicole and ES is looking wonderful. Love the over one dog! Wow oh WOW...All of your selections are fabulous!! Thant will keep you busy for about 3 weeks !!! You're such a quick stitch!! Your work is amazing and I love watching each piece progress. Now I'll get to see them in person!! Yea for both of us !!!! Elizabeth and Charlotte look fabulous. Love the linens and silks you've chosen for all your new projects. Lots of great stitching! Newbie question....why did you switch from NPI silk to Soie d'Alger? Is it a color difference, or some other preference? Thanks! They are all scrumptious, btw!! I recently bought the HE Lucy Redd one. I'll have to go check out the conversion to silks. I've always loved Hannah Pepper but never found the complete chart. 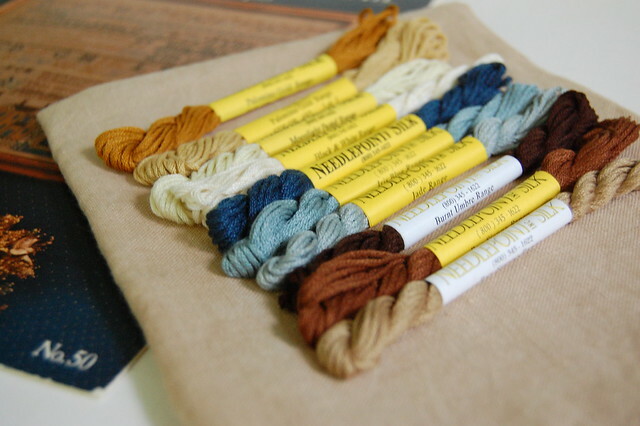 All of these projects will look terrific with your linen and thread choices. 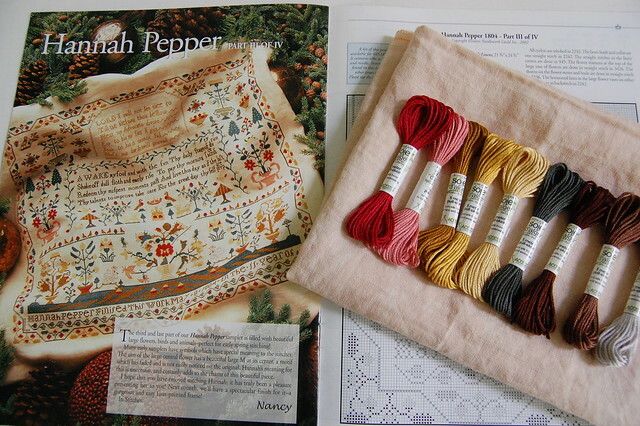 I love the colors in each of those samplers, but especially Hannah Pepper! You have some wonderful projects lined up to start. 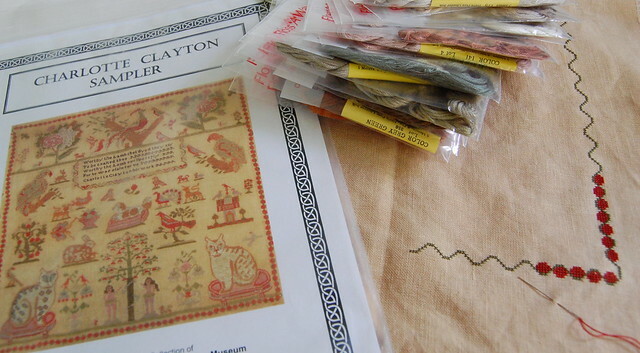 Oreo is one lucky kitty to have such a neat sampler stitched in her or his honor. I didn't know the stitch count was off on Hannah Pepper. I have had this in my stash for many years to stitch but never got around to it. Guess I'm glad I waited. Have a wonderful Mother's day and thank you for all the wonderful inspiration that you give via your blog. What beautiful projects you have planned. Your current stitching is beautiful. All gorgeous projects!!!!! Love your linen and thread tosses :-). That's a great line-up of projects! Wow, this is the equivalent of going to a chocolate shop! All those luscious silks and charts! Wonderful stitching! Beautiful projects, Nicole! Drooled all over my keyboard! I have had Mother's Garden for a couple of weeks now and cannot wait to start on it..just need to get my act together. Love that design! All those threads look like tasty treats! I really hope the NPI conversions work out for you - I think you've picked an excellent piece of linen to stitch Lucy's sampler. All of those upcoming projects look great! Nicole, you have so many beautiful projects lined up - how will you ever decide what to stitch and when! I love Elizabeth's conversion for Lucy Redd and have been watching her progress,too. Beautiful colors. Oh my goodness, what gorgeous fabric and fibers. You are going to have a wonderful time stitching all of these beauties!!! Beautiful plans! Love all your choices -- projects and materials! If I had to choose a favorite of these, it would be Hannah Pepper - just love, love those lovely colors!! Have fun with each of them. Wonderful projects Nicole! I love each and every one of them!! Oh, Nicole, what lovely projects you have ready to go! Love the colors for "Hannah"! 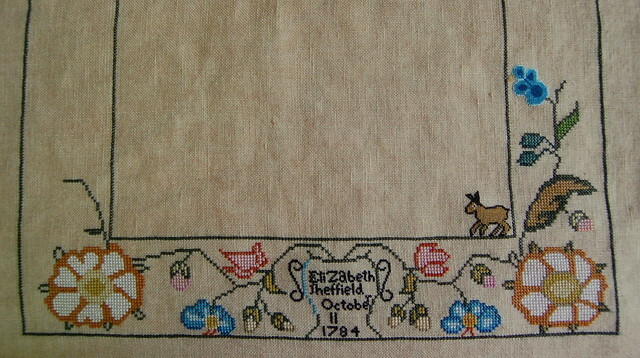 Your "Elizabeth" is looking great...her big border is fabulous! Congrats on your new family member and best wishes that your future plans develop as you hope! So many big plans! Just cannot wait to see progresses on all of them!